When was the last time you did something that scared you? The last time you really pushed your boundaries, took a risk, and felt you not only bulldozed right through your fear but, in fact, used it to propel you forward? If you’ve ever successfully confronted and overcome anything, even just for a short while, you’ll undoubtedly relate to the profound and overwhelming sense of self-satisfaction that comes with it. This experience provides you with a true sense of freedom, allowing you to breathe effortlessly and fully absorb life, knowing the only thing that can ever really hold you back is you. 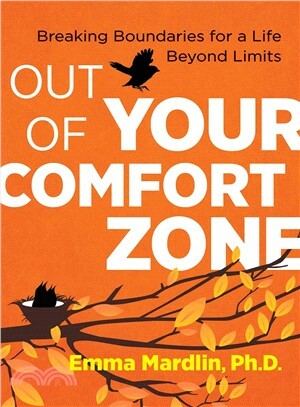 Offering a step-by-step guide to incrementally breaking out of your comfort zone and confronting and transforming fear, Emma Mardlin, Ph.D., equips us with effective working tools to conquer our deepest fears in any context, be they small or big, and harness them to push us further toward our ultimate goals, purpose, and full potential. She provides the innovative Zone Test to measure your comfort zone before and after working through the book, tools such as the intuition indicator and RACE technique, and the thought-provoking “life discovery model” designed to support you in your new adventures once you’ve conquered your fears and let go of limitations. Offering practices to start the journey toward exciting positive change, she presents resilience-builder challenges, anxiety-buster techniques, practices for indestructible thinking, and “baby steps” to build confidence. She explores why we feel fear and how fear works in the brain, anxiety-reducing foods and how they work nutritionally, as well as the key psychological markers of a fearless “zone zero” personality. Whether you experience irrational fear, have a phobia that plagues you, look back on a lifetime of anxiety and limitations, or suffer from nerves and a lack of confidence, this guide provides a full range of comprehensive resources and tools to help you fully transform your fears, discover your true ambitions, and achieve everything you can in life. Emma Mardlin, Ph.D., is a clinical therapist and founding partner in The Pinnacle Practice. Internationally renowned for her work as an author, trainer, and practicing clinician in London and Nottingham, she has profoundly changed the lives of many once plagued by intense fears, phobias, life limitations, and anxiety. The author of Mind Body Diabetes Type 1 and Type 2, she lives in Nottingham, UK.